Relational methods can be found at various places incomputer science, notably in data base theory, relationalsemantics of concurrency, relationaltype theory, analysisof rewriting systems, and modern programming languagedesign. 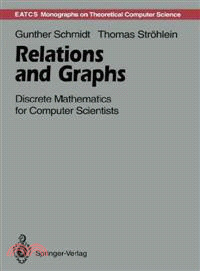 In addition, they appear in algorithms analysis andin the bulk of discrete mathematics taught to computerscientists.This book is devoted to the background of these methods. Itexplains how to use relational and graph-theoretic methodssystematically in computer science.A powerful formal framework of relational algebra isdeveloped with respect to applications to a diverse range ofproblem areas. Results are first motivated by practicalexamples, often visualized by both Boolean 0-1-matrices andgraphs, and then derived algebraically.